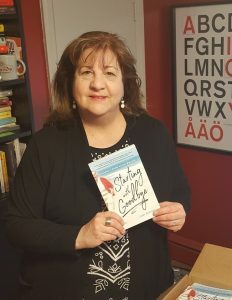 Lisa Romeo is the author of Starting with Goodbye: A Daughter’s Memoir of Love after Loss (University of Nevada Press). Her short nonfiction is listed in Best American Essays 2016, and has appeared in the New York Times, O The Oprah Magazine, Longreads, Brevity, Under the Sun, Hippocampus, The Manifest Station, Brain Child, Sweet, Inside Jersey, and many other places. She teaches in an MFA program and lives in northern New Jersey with her husband and sons. 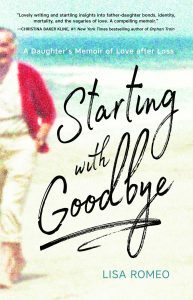 Starting with Goodbye, published by University of Nevada Press, asks if it’s ever too late to (re)connect with a parent. When Lisa Romeo’s late father drops in for “conversations,” she wonders why the parent she dismissed in life now holds her spellbound. Lisa reconsiders her affluent upbringing and the emotional distance that grew when he left New Jersey and retired to Las Vegas. She questions death rituals, family dynamics, Italian-American customs, midlife motherhood, and her own marriage as their new father-daughter relationship transforms grief and delivers powerful lessons about the bonds that last past death. One glass of Moscato or Riesling. Unless I’m hot, then I only want ice cold water! Hmm…this is tricky. I want to ask, mandatory for whom? But absent that, the way I’m feeling most days, I’d say “The Second Coming” by William Butler Yeats. A lot of them! I read nonstop, but my schooling didn’t include a lot of classics…or maybe it did and I can’t remember. Which I suppose means I need to read or re-read them all. I think in my teens I would have had more patience for Jane Austen, especially because I always longed to live in England. I’m so easily and consistently disappointed by most film adaptations of books I’ve loved. Purely for fun I’d say, Under the Tuscan Sun! Based on the book by Frances Mayes. Just a few miles from home: Watchung Booksellers, Montclair, NJ. The staff really know their stock and make interesting recommendations but will also leave you alone; there are author events at the store several times a week; and it has that quiet but sublimely buzzy vibe I like in a bookstore. How long the learning curve is, how that learning curve never ends, how you’re never really finished nor completely satisfied with what you’ve produced, even after it’s published! I’ve just published my first book, so I can’t speak to what it will be like to move on to book two. Though I’m guessing: equally difficult! I’ve published hundreds of essays, articles, and other short nonfiction pieces, and each one poses its own challenge to write and place. It doesn’t get easier, you just know more and can avoid the obvious mistakes. I’m a horse person from way back. I had five horses over about 17 years, and I rode and competed in hunter-jumper horse shows from my teens to my early 30s. This changes constantly! I suppose I should say my own, since it’s a photograph of my father that I took. But recently, my favorite cover is Still Life with Horses, a memoir by Jean Harper. A horse’s eye is very special and the artist (Benedicte Gele) captured it perfectly in pastels and chalk. Take a look, you’ll see. Sarabande Books does a lot of interesting things with essay and other nonfiction forms. Missouri Review, for overall consistency and readability. I’m never disappointed. Working Stiff: Two Years, 262 Bodies, and the Making of a Medical Examiner by Judy Melinek, MD and T.J. Mitchell. Because I was wandering through a bookstore after doing a reading, and my eye always lands on books about death and the many things that might come after! (I’m strange that way).